Edina, MN - September 17, 2017. 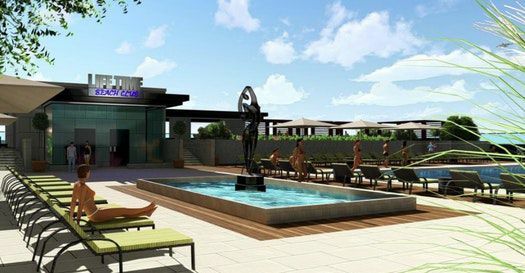 Edina's new 120,000 square foot Life Time Fitness location will the Twin Cities' most ritziest, featuring a roof-top pool, "luxury hotel-like services", and "full-blown medical", according to a June 6 article in the Minneapolis Star Tribune. But while the project will apparently spare no expense when it comes to facilities, the same can't be said of work being done to prepare the site for construction, including demolition and removal of asbestos from a former J.C.Penney's location that will become the home of a luxury Life Time Fitness Club. Since Life Time athletic clubs started popping up in the Twin Cities in 1992, founder and Chief Executive Bahram Akradi has wanted a location in Edina. Now it’s going to be reality. After J.C. Penney closes its Southdale location by mid-August, most of the building will be razed to make way for a 120,000-square-foot Life Time. No amenities will be spared at the diamond level club. Akradi said the new model of club offers a level of service found at a Four Seasons or Ritz Carlton hotel. The three-floor facility will have a bistro and outdoor pool on the roof, which is expected to be open from spring to fall. It will also have full-blown medical service similar to its St. Louis Park club, which offers a collaborative, comprehensive program that includes a doctor, dietitian, exercise physiologist and a personal trainer. There will be an indoor pool on the main floor, as well as LifeSpa, Life Cafe, and a Kids Academy. Group exercise and cycle studios that monitor individual vitals on screens featuring multiple class formats from Warrior Sculpt yoga to Strike! and TCX classes will be offered along with a dedicated Alpha training space, similar to CrossFit, and a training floor with 400 pieces of cardio and strength equipment. Ultimate Hoops basketball leagues, chiropractic and physical therapy and a proactive care medical practice are also included.